Sponge Iron Industries (OSIMA group of companies) are among the leading companies in manufacturing Sponge Iron and its derivative products in Odisha. These group of companies are spread in the whole Eastern Zone, utilising the available resources to fulfil the need of the state. While pollution level across our country is increasing gradually, it was mandated to monitor the pollution level of various industries at continuous interval by Central Pollution Control Board (CPCB) as well as State Pollution Control Board (SPCB). Our client, the OSIMA group, presented us the challenge to make their pollution data online, so as to make it available in real-time for the State pollution board, Central pollution control board and view it in the real-time dashboard as well. We presented them our real-time online data transmitter "TraDe" to address this particular challenge. In the beginning, it was quite unknown how to acquire the pollution data from multiple analyser and send it to SPCB server because of protocol mismatch. There were many complicacies regarding how to see the real-time dashboard of pollution values in our server if data is sent only to SPCB server. We faced quite a few problems initially in the interface and data handling between TraDe and the respective communicating device. After an exhaustive research and in-depth study, we were able to analyse the systems better. Here the communication standards between the gas analysers and TraDe are different at different industries varies from instrument manufacturer to manufacturer. For some analysers, the input to our device is 4-20 mA signal and for some others, it is RS-485 or RS-232 or MODBUS standard. Interestingly, TraDe is now designed to be supported with all the above protocols so that it can be used across any of the above mentioned standard devices. It can fetch the data from the gas analysers and transmit it in specified format to multiple servers continuously – in this case to SPCB server and Phoenix Robotix cloud server. The data is received at our cloud server, and the values are displayed at our IoT (Internet of Things) platform "DATOMS ®". It offers a systematic display of data variations, current data trends for over 24 hours, data violation frequency, one-hour average data report, data download option in different patterns such as – raw data, data averaged over a flexible time and options with multiple file format. The predictive analysis and suggestion algorithm warns the industry management authority with SMS and Email when pollution level of a particular pollutant is above the threshold limit and thus help them detect any malfunction or faulty process, thus avoiding impending charges over violation of any SPCB norms. After the OSIMA group, we helped many other industries in Odisha to publish their industry pollution data online to be available in real-time. In the above-described manner, Phoenix Robotix can provide hardware and software solutions to industries to fulfil their statutory requirements of real-time online pollution monitoring along with providing analysis tool for predictive maintenance. 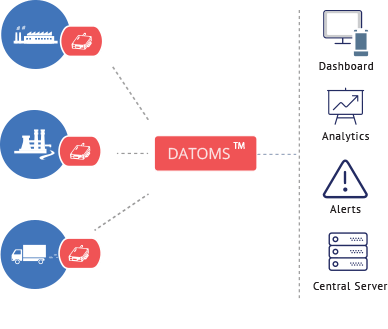 In similar fashion "TraDe" – an IoT enabler can easily be used in other sectors such as Ambient Air Quality Monitoring Stations (AAQMS), real-time flood monitoring, smart energy meter and the integration with our platform "DATOMS ®" will provide a complete end to end solution to the clients.